A truly original shop on the Gloucester Road, Bristol. I am a printmaker specializing in pictures of animals, boats people and clouds. I grew up in Devon and later lived in London, where I worked as a scenic painter and muralist. In 2002 I moved to Bristol, where I share a screenprint workshop with a friend, near the harbour. I have a long term relationship with Fig as I am married to one of its artists, Katie Wallis. Can you talk us through the process of creating a piece of of your work? My prints are largely from my imagination, although l also do a lot of drawing and sketching. Much of my work is a form of visual storytelling, that shows a particular moment but suggests something more. There is sometimes some humour in my prints. Once l have my idea and have developed it through drawings it often changes quite a lot. After this the process of creating the separate colour layers for screen print begins, by drawing onto film and then transferring onto nylon screens to be printed with a squeegee. The print process is a hand process that allows for further changes or additions to be made. Describe your studio or workspace? I share two rooms at Centrespace, just off Corn Street with another printmaker, Lucie Sheridan. We have a room for printing and a clean room for drawing and office type things. The print room is set up for tree people to work as l teach regular courses in screen print from here. We have really nice big North facing windows that are overlooked by the Crown Courts - sometimes you see people in wigs looking down at you. Who inspires you? Who are your favourite makers ?artists? Eric Revilious and Edward Bawden are lifelong favourites of mine. 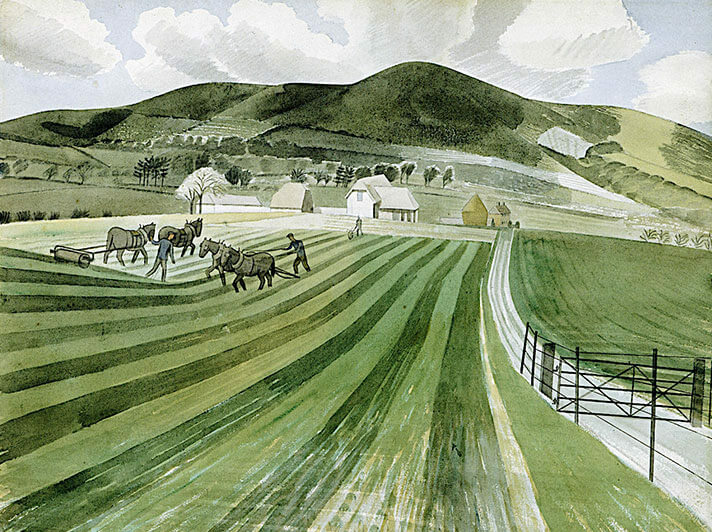 I particularly like Revilious watercolours and Bawdens linocuts. Currently l am liking Thai green vegetable curry using homemade green curry paste, taken from a book called Vegan Street Food. Do you have a dream or goal you’d like to share with us? I want to have a picture book published - l have begun working on one, hoping one day to complete it.